Burying dad in the sand! There is so much you can find on a beach that has been washed up by the sea, unfortunately most of it is man-made litter, there are millions of tonnes of rubbish in our seas not just around Britain but worldwide only small amounts get washed up on the shore, this is a big problem which is getting worse, harming birds, animals, fish and sea creatures. 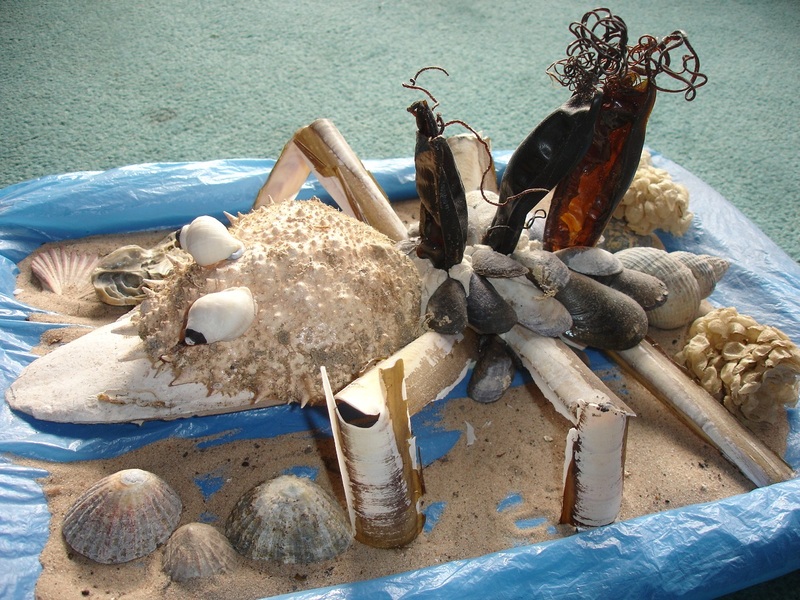 Why not make a Sea Creature with your beach treasure? You can either make your creature on the beach or when you get home, we made ours at home. Start off by making a body from damp sand or if you are at home you could use modelling clay, and firm your shells into place on the body, then add arms, legs, a mouth, eyes, hair, claws, tails and wings. This is your Sea Creature be creative you can make it how you want, it can have 2, 4 or 6 legs, 2 or 3 heads or tails, you can give it wings or claws and as many eyes as you want. Firstly we got a storage box lid and covered it with a blue plastic bag to represent the sea; you could also use a tray or cover it with kitchen foil. We then got a piece of white modelling clay, made it into an egg shape and pressed it onto the lid. We covered the modelling clay with Mussel shells to make the body, and used broken Razor shells for the legs, the curly tail was a large Whelk shell. For the head we used a Cuttlefish bone for the lower jaw and the top was a Spider Crab shell, two eyes were made out of small Whelk shells which were stuck on with the modelling clay, I drew on two eyes with black marker pen. The crowning glory was the three Dogfish Egg cases that we placed along his back. 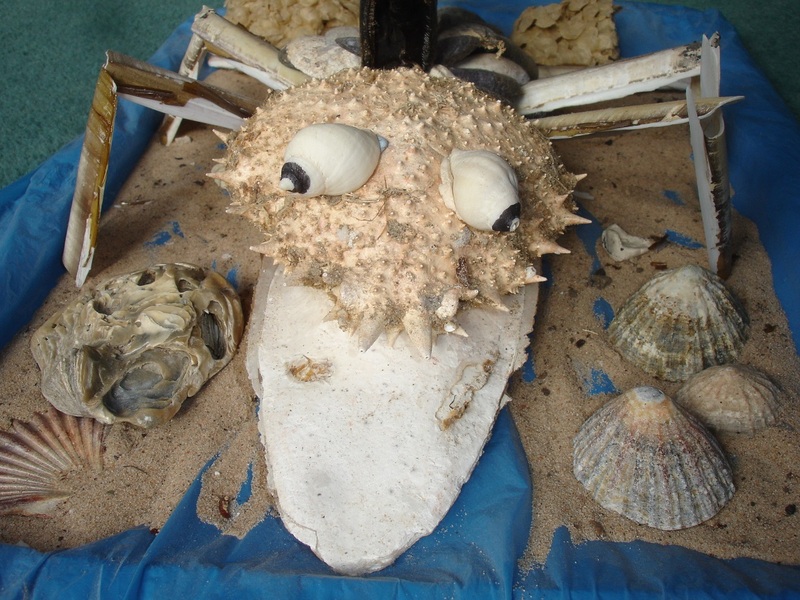 To finish it off we sprinkled sand on the lid and placed some shells and Whelks egg cases around him to make him feel at home! It is a good idea to buy a guide to the seashore so that you can identify and learn all about what you find on your day out. 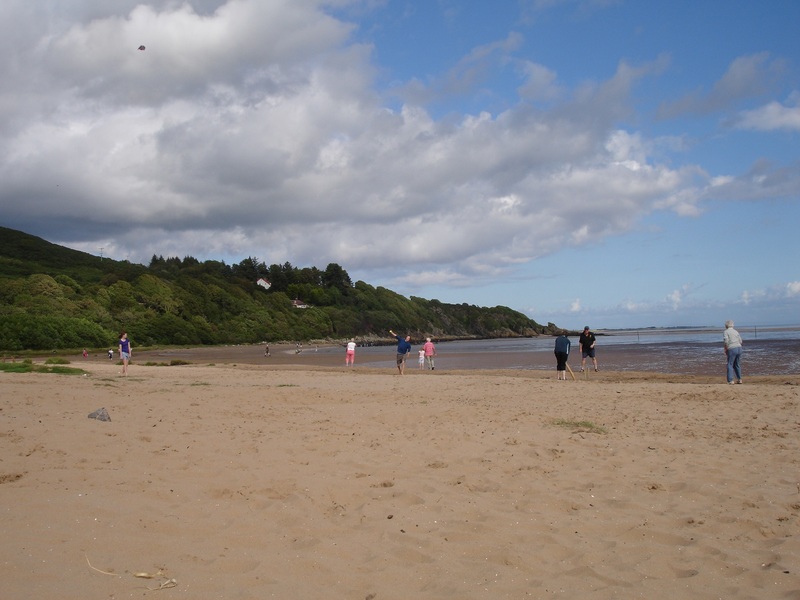 Have fun on the beach this summer, enjoy all that the seaside has to offer and help to preserve it for future generations by taking you litter home with you – the British Coastline is stunning and home to many amazing and unique plants, animals, fish, sea creatures and birds.